It’s time to learn the method for How To Delete Quora Account from Android and PC 2019? And that is quite simple and easy and the Quora had made that easy so that you can simply follow some steps and get your to account permanently deleted from Quora database. And I’m going to explain that by step by steps. So have a look at the complete guide discussed below to proceed. Quora is one of the largest questioning portals where people can add questions and even answer the questions. Now for the user who has to add the new question or answer them, there is the need to create an account on Quora. But once the account on Quora is created the user can be confused on how to delete that account. There can be several reasons for why you might wish to delete the quora account. Fortunately, there is a way out through which this can be done and we have found this way especially for your use. 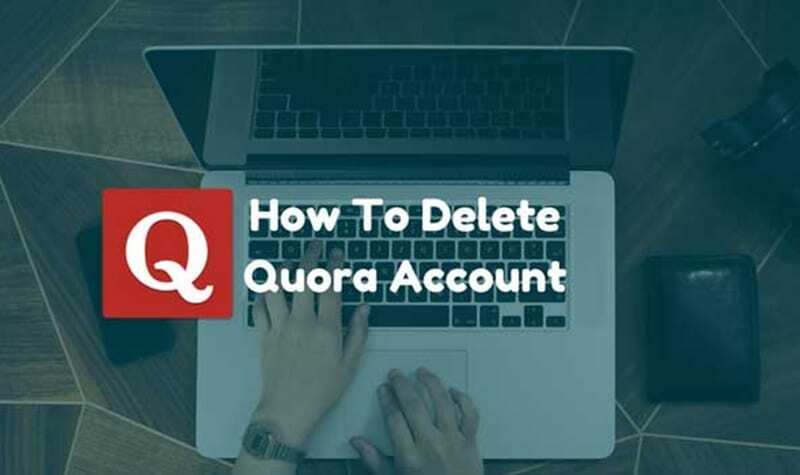 Here in this article, we have written about the best method through which the account from the Quora can be deleted right on the Android or PC. If you are interested in reading about this information or find it helpful for your usage then please read it down. All of the proper information is provided in the main section of this post as is given below, remember to read till the end of the page so that you get the whole knowledge regarding the topic. So, let’s get started. Recently my sister told me to delete her Quora account as she was not using it for a long time and wanted to register the new account on the same mail. So I told her to do that by herself and got the answer that she was not able to find the delete account option. Even I didn’t know where that option was so I explore the things and Google the method and got the way by which I was able to instantly delete her Quora account permanently. And I taught her the same. Then I took some screenshots of the steps and decided to write one guide on this so that my Techviral Visitors can also know about this. So follow the simple step by step discussed below to proceed to get the account deleted on both the Android and PC. #1 First of all go to the Quora website through pasting the link on the browser address bar inside any of the device. This method can be performed easily on both of the Android as well as PC so start to follow it up. Once the Quora website is opened, click on the Login button so as to get inside your account. If you haven’t yet logged in then log in would be required unless you can skip this step. Once this step is completed proceed to the next step. #2 In this step you need to find up the Name on the top right corner of your account. Click on your name and this will take to the dropdown where there will be the number of options available. Out of all the options of the dropdown select the Settings option. Proceed again to the next step after that. #3 Click on the privacy tab and then you will reach to the privacy settings page. On that page will be an option in Red color that will be Delete Account. Simply click on that option and the Quora account will be deleted immediately. #4 Remember that you can perform this method on both of the devices including Android as well as PC. This is a simple and few steps method so anyone can delete the Quora account almost immediately! #5 There will be a deactivate link displayed on the same page of privacy settings in blue color. If you wish to close your account for some time then this option can be used rather than deleting the account permanently. Choose the option wisely as if you choose the permanent deletion then you will not be able to get that account revert. So its better to deactivate it rather than going for the deletion if you are not planning to re-register on the same mail. Finally, after reading this article, you have got to know about the best method through which you can be able to delete the quora account right from Android and PC. All of the information given here is written in such a way that anyone can get about the important aspects easily. Hope that you might be liking the information given in this article if it is so then please try to share it with others too. Also, share your suggestions and opinions regarding this content by using the comments section below. Your indulgence in our work is really grateful to us, keep supporting us and we would be always coming up with all new amazing information. At last but nevertheless, thanks for reading this post! And if you have any topic in the mind that you want us to write then please share with us so that we can work on it for you and you can explore the things better with us.